Yesterday Canada's Senate released their report on obesity which focused primarily on prevention. I'll likely review that some next week, but today I want to talk about how physicians are approaching obesity in their offices. The short answer is not well. Bluntly, it's not just that the average doctor isn't skilled in treating obesity, it's that the average doctor doesn't treat obesity. That photo up above, that's the actual chart note, provided by an actual physician, to a friend of mine with obesity who had gone to see them for help. 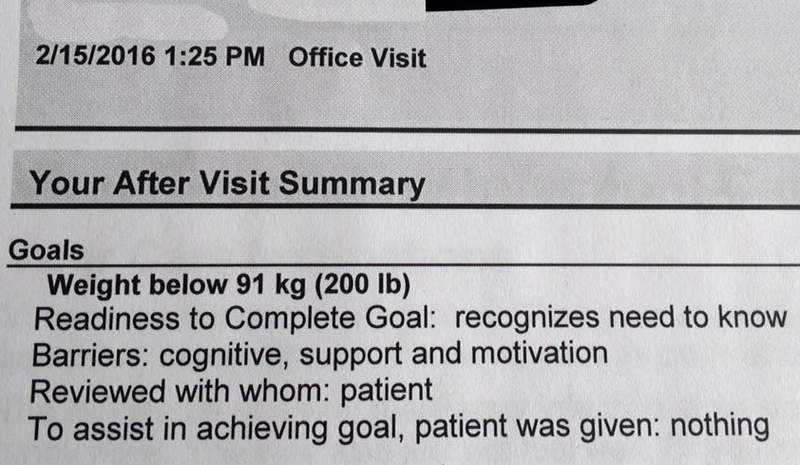 The note's pretty clear in terms of why she was going to see the MD - her goal as stated was to weigh less than 200lbs. The MD noted her barriers, reviewed them with the patient and then, the kicker. 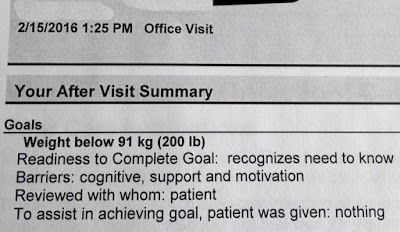 "To assist in achieving goal patient was given: Nothing"
You shouldn't be surprised though. Physicians can't treat conditions they aren't taught to treat, and obesity medicine is incredibly underrepresented in the medical curricula of both medical schools and medical residency programs. And it's not just obesity medicine that's not being taught to our future physicians, they're also not being taught about nutrition or physical activity. One recent study of Canadian medical students highlighted the fact that the majority of those polled not only weren't comfortable in discussing nutrition with their patients, but that they also weren't taught how to identify credible sources of nutrition information. Another recent study, this time of American physicians, found that more than half received no formal teaching around physical activity and consequently, may not be prepared to counsel their patients on how to adopt exercise safely and realistically. And yet lifestyle, made up in large part of nutrition and physical activity, has been said to help prevent or treat an estimated 80% of chronic non-communicable diseases. Putting the how we got here question aside, reading that physician's note I couldn't help but wonder whether the MD who wrote it was struck by the cruel poetry of its last line, as in just 9 words he or she pretty much summed up how most people with obesity feel about the help their physicians have offered.